Roth Law is conveniently located in downtown Novi at the Mainstreet Business Center, in the same building as and two doors left of the new Library Sports Pub & Grill restaurant. 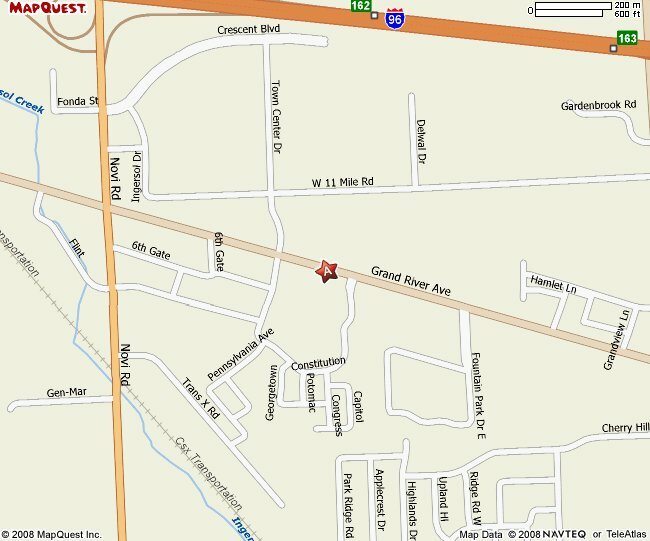 The office is close to a major freeway (I-96) and just south of Twelve Oaks Mall. Access the office complex from Grand River Avenue between Constitution and Market Streets. Either turn in by the Mainstreet sign and the building is on your left, or take Market Street off of Grand River Avenue and turn left into the parking lot at the Rojo restaurant (our building is then straight ahead). Look for the purple awnings of the Library Sports Pub & Grill; our door is centrally located to the left of the restaurant. The office is handicap accessible with an interior elevator. The office is also dog friendly. General reception services are provided during business hours, which are 9 a.m. to 5 p.m., Monday through Friday. The office is not open on weekends. Appointments must be scheduled with the attorney or legal staff (the receptionist does not schedule appointments). Materials may be dropped off and picked up at the front desk (please see the receptionist) at any time during the general reception hours. Early evening appointments are offered on a case-by-case basis in the discretion of the attorney, but weekend appointments are not available. The office is dog-friendly for short meetings. Please do not leave your dog in your car, especially on summer days. Bring him or her up with you! If you have further questions, please see the detailed driving directions or the firm’s general contact information.